Oren, an International Society of Arboriculture-certified arborist, looks for a sense of artistry in his own work, too. He and his wife, Tiffany, are the owners of Bluestone Tree. The company focuses on tree removal, pruning, and bracing. The couple started the company in 2010. Oren is from Shoals, Indiana, and was trained as a paramedic. He also served as a police officer in Mitchell, Indiana, and in Bloomington. Later, he worked fighting fires and in forestry management in several western states and Alaska, even appearing in a complete season of the History Channel’s Ax Men where he worked on a crew that lifted dead trees from Montana forests with a helicopter. When he’d had enough of what he calls “reality TV antics,” Oren, 39, brought his experience back to Bloomington and launched Bluestone Tree, located at 4011 S. Walnut St. Pike. “Bloomington is a great place to raise a family,” Oren says. “Everyone shares an idea of community.” He and Tiffany have three children. 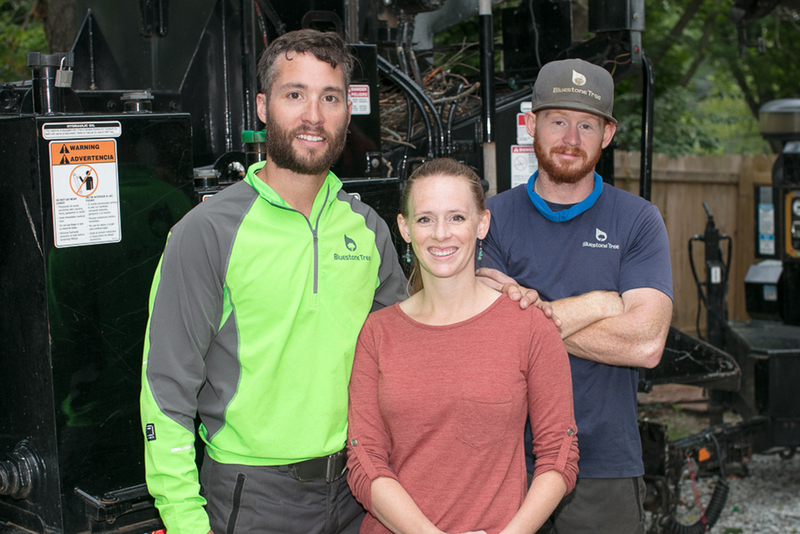 Oren says Bluestone Tree is the only tree service in town with a grapple saw, which attaches to a crane boom and cuts, grabs, and carries limbs to a wood chipper, which prevents damage because limbs aren’t dragged on lawns and there’s no foot traffic from tree to chipper. When workers need to be elevated, Bluestone Tree uses a spider lift (no other local tree service has one, Oren says), a 3-foot-wide vehicle that fits between houses, maneuvers flexibly around backyard obstacles like barbecue pits and gardens, and causes less soil compaction than cherry-picker trucks. Crews lay down mats along the spider’s route, further reducing compaction of the soil. For more information and to see the video, visit bluestonetree.com. A Tree Story, with Bluestone Tree from Bluestone Tree on Vimeo. Large Oak Removal from Bluestone Tree on Vimeo.